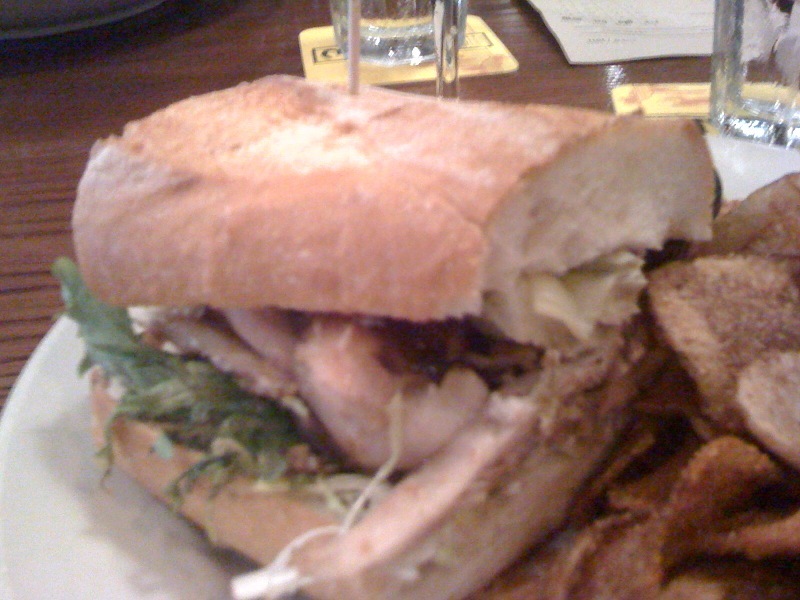 I like when I go to a bar for a sandwich and there's a section of the menu called "Beer Food." Makes sense. Goose Island appears to be one of Chicago's favorite craft breweries, and there are tasty suds galore up in here. There's some pretty good food to go with 'em, too. The green goddess sandwich is a crusty, warm baguette with a decent-sized pile of rotisserie chicken (mostly dark meat -- yum), artichokes, frisee, ramps and a light, creamy, seemingly whipped spread probably based on green goddess dressing. The dressing is mayo, sour cream and a bunch fresh herbs; this sandwich spread might be the same but it wasn't mayonnaisy at all. It was closer to cream cheese without the overpowering cheese taste, flavored instead with lemon juice and maybe basil or tarragon. Not sure. But it was unique and delicious, and added a nice subtle touch to this sandwich.